Russia will continue to work on building a marine version of the attack helicopter Ka-52, despite the uncertainty about the supply of assault helicopter carriers “Mistral” to the Navy. These will aid in operations against both tanks on the surface and ships at sea. Russia will continue to work on building a marine version of the attack helicopter Ka-52, despite the uncertainty about the supply of assault helicopter carriers “Mistral” to the Navy. “First, our own helicopter carriers are under construction, and second, a helicopter such as Ka-52K will be highly demanded on the ships of our surface fleet,” - Deputy Defence Minister Yury Borisov told TASS. Two assault helicopter carriers, called “Mistral”, have been built for Russia by France but have not been transferred yet to the Navy, after relations between Russia and the European Union have deteriorated and sanctioned imposed after the unrest in Ukraine. The “Mistrals” were supposed to be armed with Ka-52K “Katran” (marine version of the newest attack helicopter) helicopters. It was originally planned that the first Ka-52K would be ready for testing in early 2015, but that development has been delayed. According to Borisov, the operating conditions for helicopters at sea are significantly different from terrestrial ones, therefore further improvements in terms of materials and components are required. “Katrans” were designed primarily to provide fire-power support to landing forces, with key targets being tanks, armored and unarmored combat machinery. They can also destroy enemy helicopters. Ka-52 is armed with rapid-fire 2A42-1 30 mm guns. The weaponry may also include “Strelets” (Sagittarius) missile system launchers, for guided missiles such as “Ataka” (Attack) and “Vihr-1” (Vortex), and launchers for unguided type C-8 rockets. The distinctive feature of supersonic anti-tank missiles “Vihr,” with laser targeting, is the fact that even if the pilot does not actually see the target, he can still fire with confidence, because of a “hint” received from ground troops. 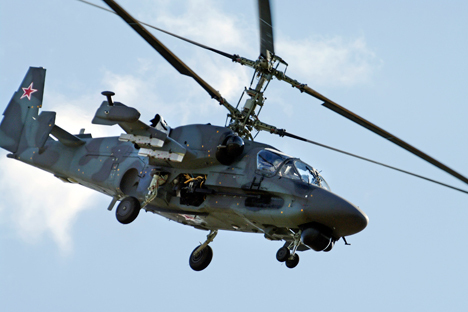 The Ka-52 also features high-performance flight characteristics. Powerful gas turbine engines VK-2500 enable it to fly at an altitude of over 5,000 meters. The hover ceiling is 4,000 meters, which allows for take off and landing in hot climates and at high altitude. The maximum speed of the helicopter is 300 kilometres per hour. The “Katran” will have many features, including stable anti-corrosion treatment, folding blades and wing panels. It will be also be equipped with necessary weapons systems for naval battles. The helicopter's marine version will carry an expanded range of both guided and unguided weapons. It will be possible to keep these weapons on combat alert round the clock and in all weather conditions. In the military-industrial complex where they are being designed, the ship-based Ka-52K could potentially receive a new airborne radar, which would allow it to use anti-ship missiles X-31 and X-35. This factor makes the Ka-52K an absolutely unique fighting machine. Until recently these anti-ship cruise missiles could only be used from Su-30 and MiG-29K aircraft.